With YOUR help, we ARE making a difference! Save The Colorado’s policy is “No New Dams And Diversions”, and we will fight to stop every proposed new dam/diversion to the best of our ability and resources. 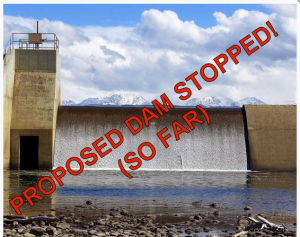 This is the first of nearly fifteen dam/diversion proposals that Upper Basin states — Colorado, Utah, Wyoming — and water agencies therein are trying/hoping to build. They are all on our “target list” of “irresponsible projects” (listed here on our website). And, this is all happening when the Lower Basin — California, Nevada, Arizona — is on the brink of a “shortage” and the Colorado River is in a historical drought facing an ecological crisis. We are able to do this work and stall/fight these projects because of YOUR financial support! Thank you for helping to Save The Colorado River! Press Release: Congressman Polis Acts to Save Rivers!